Yard List for bird species this year. Date of first arrival for birds we've seen at our house. Date of first arrival for birds we've seen in Fairbanks. Full list of Alaska birds. Software used to store the data and produce these pages. 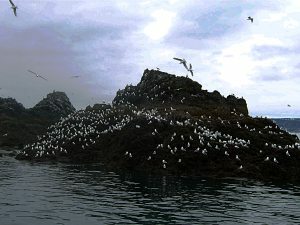 The image on the right shows Gull Island, Kachemak Bay, Alaska.